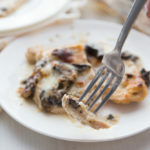 If you are looking for a new chicken keto recipe, then my Chicken Lombardy Recipe is a perfect choice. 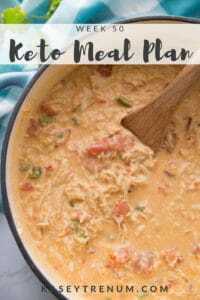 This delicious and easy meal is satisfying and of course keto and low carb friendly. Everyone in my family feels the same about mushrooms so you can imagine their surprise when I came home from the grocery store with them. 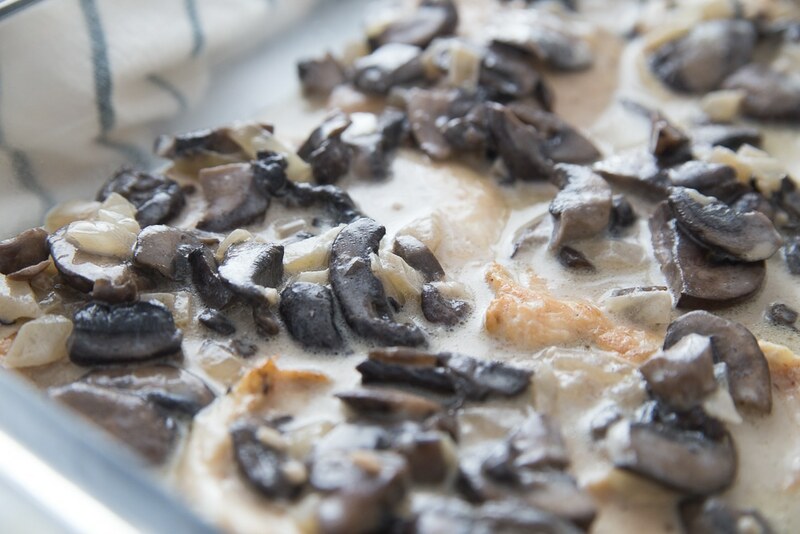 Surprisingly, at dinner, my hubby and son loved the mushrooms in this dish. My oldest daughter and I still picked ours out, but it didn’t take away from how delish it made the chicken. 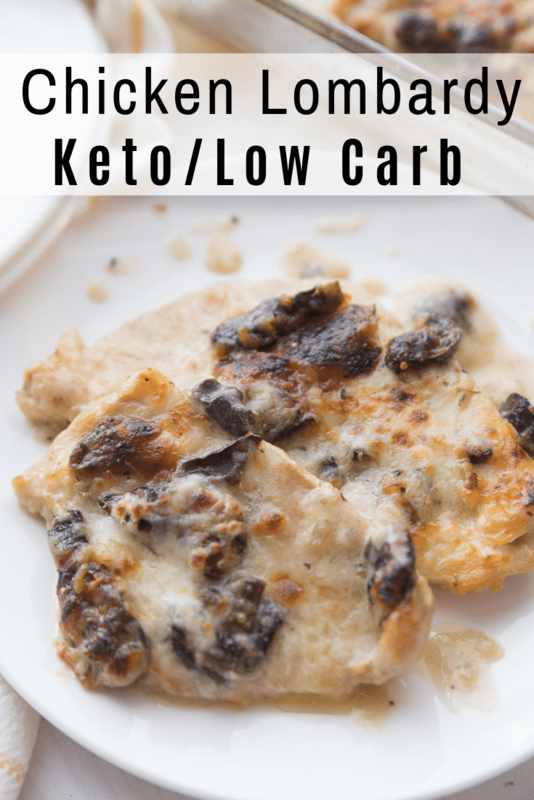 It’s one of our favorite keto/low carb meals so far. Sauting the mushrooms in butter with the onions and garlic brings out the incredible flavor. 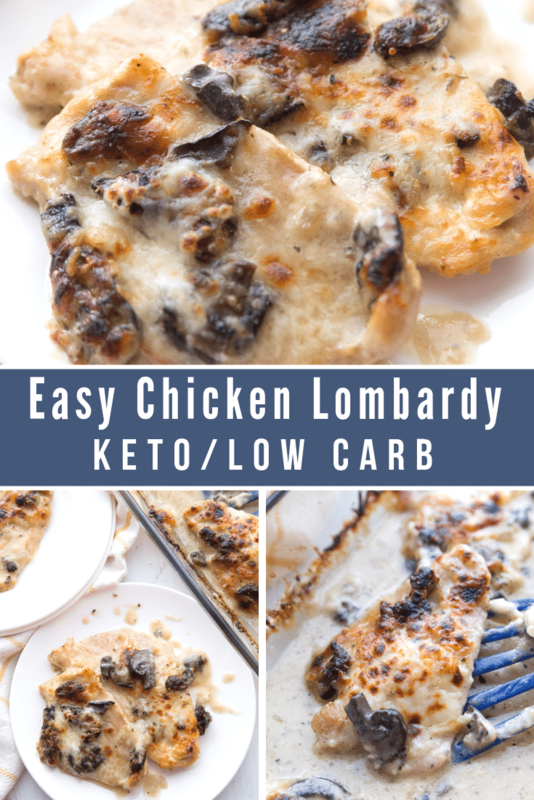 I prefer thin cut chicken for this Low Carb Chicken Lombardy recipe, but feel free to substitute chicken thighs, breast tenderloins, or another cut of chicken if you prefer. Make sure to adjust the cooking time accordingly. 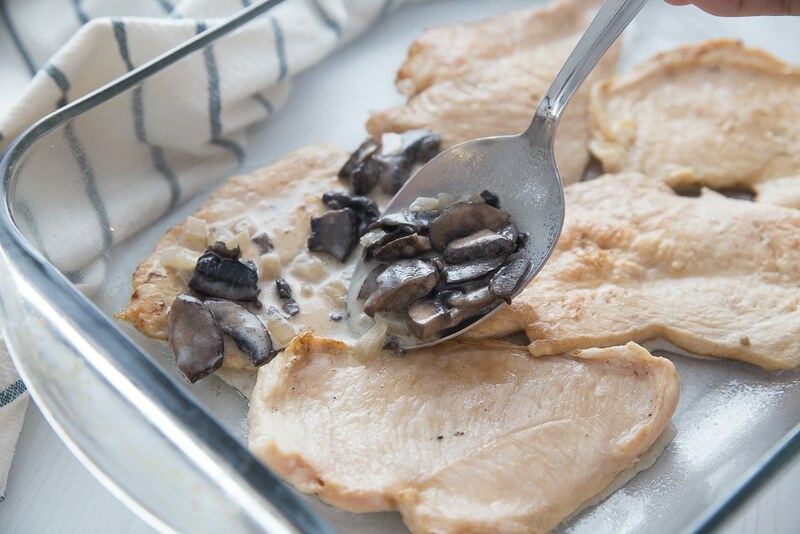 Even if you plan on picking the mushrooms out like me, I recommend leaving them in the casserole until the Keto Chicken Lombardy is cooked so that all of the flavors from the mushrooms can render. The sauce stays somewhat brothy. Adding a little bit of the Xanthan Gum thickens it just a bit, but you can also omit if you prefer as it will taste the same with or without it. I always recommend shredding your cheese to avoid fillers that add unnecessary carbs to the preshredded varieties. Doesn’t that look amazing? 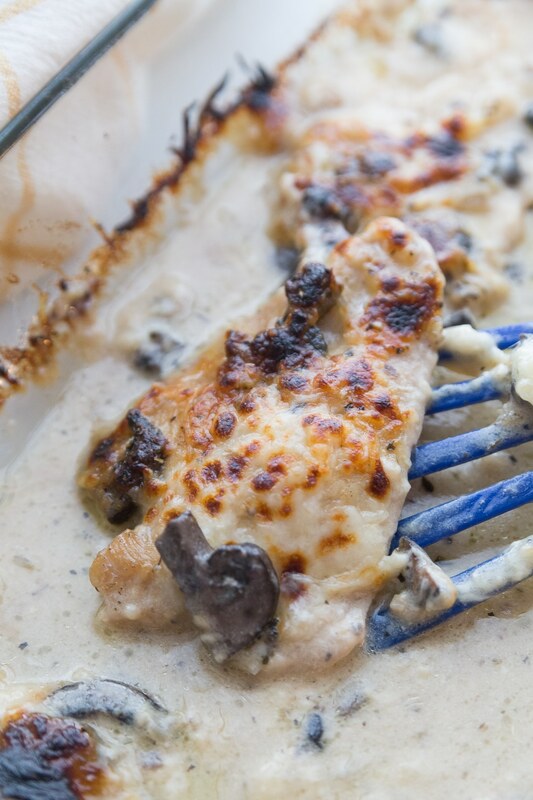 I never imagined I would love this Keto Chicken Lombardy as much as I do, but it tastes restaurant quality without all the effort. 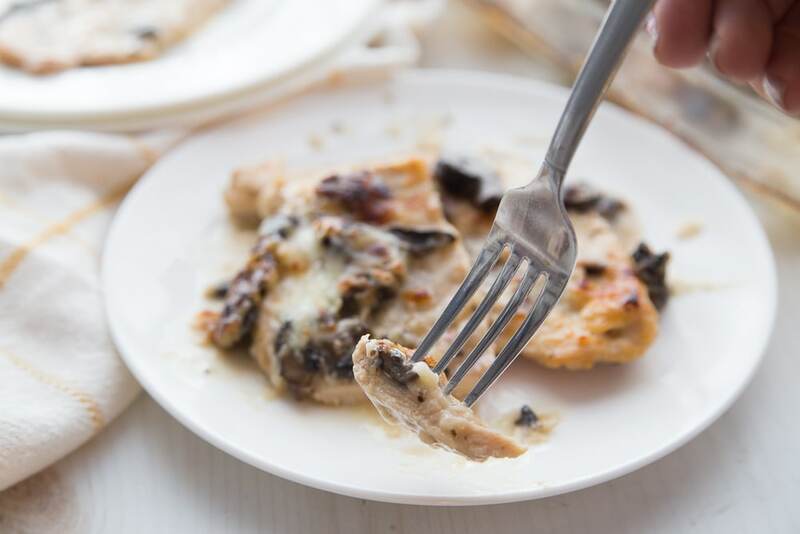 We serve Low Carb Chicken Lombardy with roasted asparagus or brussels sprouts and a leafy garden salad for an easy and delicious complete meal. Grease a 9X13 casserole dish. 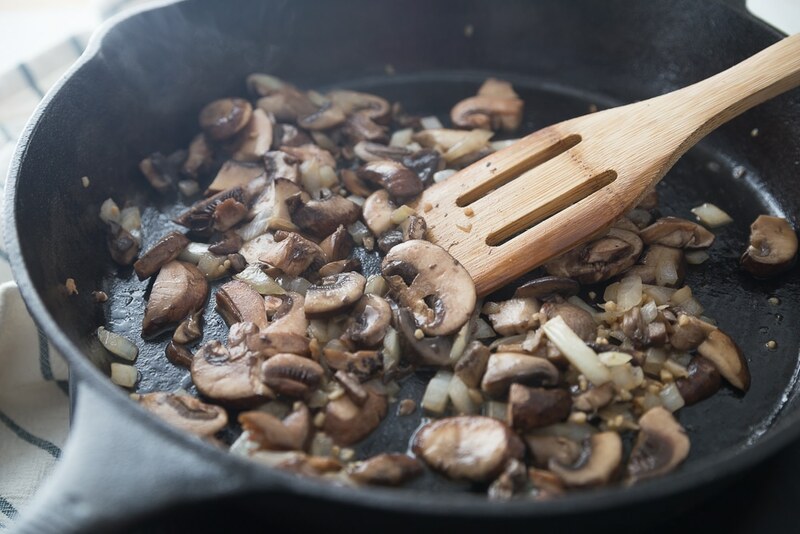 In a large cast iron skillet, melt 2 tablespoons of butter and saute the mushrooms, garlic, and onions on medium-high heat for approx 10 minutes until onions are translucent and mushrooms are very tender. 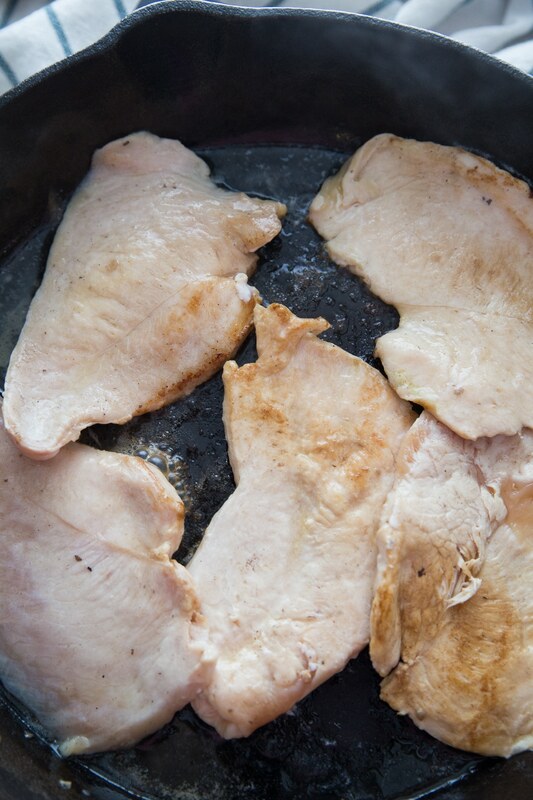 Melt 3 tablespoons of butter in the same cast iron skillet and sear chicken breasts or tenderloins 3-4 minutes on each side so that they are nicely browned. As each piece is browned, remove from skillet and place in the casserole dish leaving all of the drippings in the skillet. Once all the chicken has been browned, add mushroom mixture back to skillet along with chicken broth, heavy whipping cream, and salt/pepper. Cook on medium-high heat scraping the bottom of the skillet while stirring continously for 5 minutes. Turn off the stove. Sprinkle 1/8 tsp xanthan gum on top and allow the sauce to thicken. It will take 5-10 minutes for the sauce to thicken just a bit. It will still be a bit broth-y as you don't want it to thicken too much. You can also omit the xanthan gum as it does not change the taste of the dish. Once it has thickened just a little spoon over chicken in the casserole dish. Sprinkle parmesan cheese over chicken first, then top with mozzarella. Top with 1 tsp Italian seasoning. Bake in a 450 oven for 12-14 minutes. 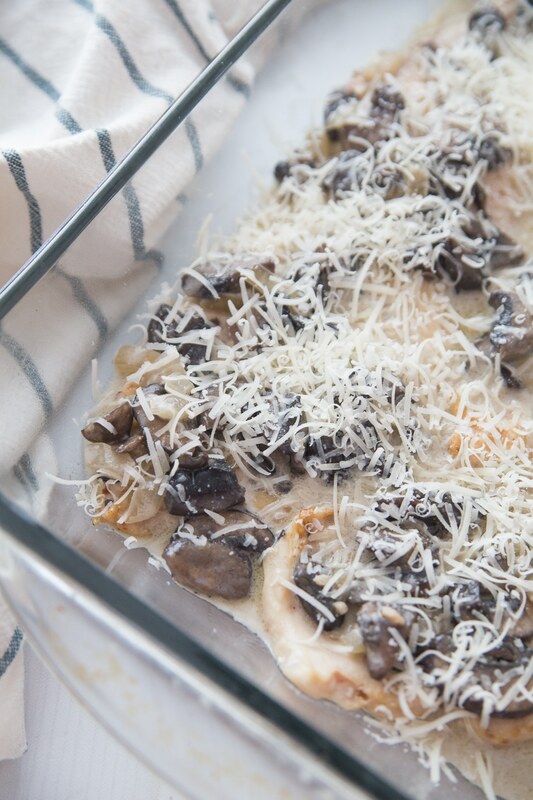 To brown mozzarella, move casserole dish to top rack and turn oven to broil for 1-2 minutes. 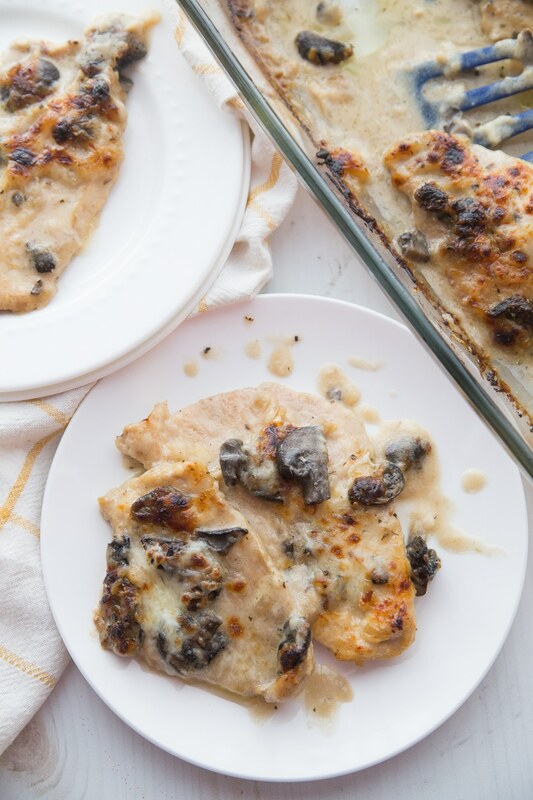 Making this Chicken Lombardy recipe is going to become a habit in your meal plan. 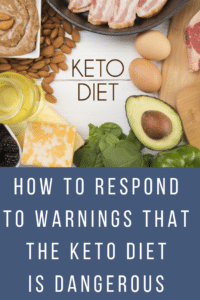 You can find tons of other delicious ideas in my keto recipe index. 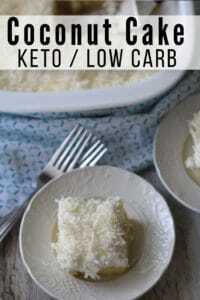 Check out all of our tried and true low carb friendly recipes there to begin your own meal plans. Below you’ll find a few of our favorite recipes to get you started! What does the Xanthan gum do???? 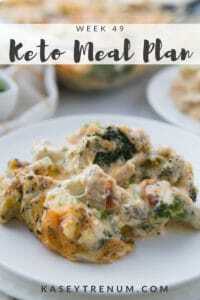 We made this tonight and it was one of the best things we’ve ever eaten, keto or not! Thank you! Awesome! So glad you loved it. Thanks for taking the time to comment. This sounds so yummy! Could I make it without the xanthan gum? I’m new to the keto lifestyle. Are there any other keto friendly substitutes I could use to thicken the sauce? I’ve only used Xanthan Gum. Made this for supper tonight and it was delicious! Happy to have some leftovers for the next couple of days since I’m the only mushroom eater in my family. Thanks for a great recipe! I made this tonight and the entire family loved it!! I am the only one in family who likes mushrooms so I used large portabella slices. It allowed family to pick it out. Wonderful recipe that I’m sharing with several friends. Thank you. Awesome! I’m so glad you all loved it. Is there a way to make this a Crock-Pot meal? I’ve only made it as is so far, but it’s worth a try. I don’t have a cast iron skillet – just a big ol’ non-stick kind! I’m assuming that’s ok?? Because I would really like to make this! Thanks! Signed, Not Very Savvy In The Kitchen ? Sure! Use whatever kind of pan you’d like. 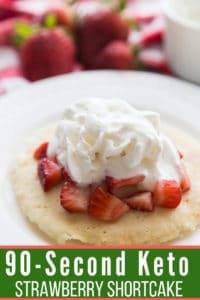 I love getting great recipes that everyone can enjoy! have you tried this as a one pot and used the cast iron for baking? I’m all about less dishes! I have not but it sounds like a great idea! How big is a serving, ie. How many pieces of chicken and how much of the rest? For instance, 1 cup of sauce over piece of chicken breast? Thank you. I really don’t know. I am not that precise. This is a casserole so the sauce isn’t separate. My sauce did not thicken at all. Is the measurement correct for the xanthan gum? Doesn’t seem like an eighth of teaspoon for that much liquid could be accurate. It isn’t supposed to get super thick. It should still be broth like. You don’t want to use a lot of Xanthan Gum or it would thicken up too much. Will give this a try, love your recipes. I just made the Keto Fried Cabbage with Bacon…Smells so good. We made this tonight. So good. Before I started this WOE I had this dish. I ate it tonight. Thanks because it was good.